Judging by this year's shows, the classic clean-cut look might be on it's way out. 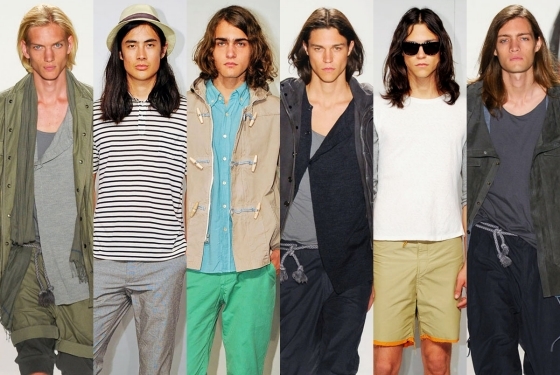 First noticed at Tommy Hilfiger's spring 2012 menswear collection, the line-up featured the usual classic if not conservative looks donned by male models with longer than average locks. The look even cropped up in varying degrees at Perry Ellis, Simon Spurr, Lanvin, Tim Hamilton, Nicholas K., Marc Jacobs, and Steven Alan shows. "Men's fashion in the past few years had been based solely on very clean, handsome, and beautiful men," said Hendrich. "Finally, the trends are starting to change, and with that has come longer hair and more editorial faces." But remember guys, if you're attempting to follow this trend, hygiene is always a priority. No girl in her right mind would want to run her hands through your sweat soaked hair, even if you look like a model.